Gradual deterioration of our teeth is an inevitable part of ageing – we are living longer and longer lives and giving our teeth more and more work to do. Teeth typically become more brittle with age and can chip and crack more easily. Age-related deterioration is a common cause of the need for dentures. Other possible causes include accidents, gum disease, serious wear to the teeth and serious tooth decay. Missing teeth often result in a poorly formed bite pattern (occlusion), altered appearance and speech. Any of these scenarios could result in your dentist recommending tooth extraction, dentures or both. A denture (also called a dental prosthetic) is a set of artificial teeth – few or many – together with a means of holding the artificial teeth in place. 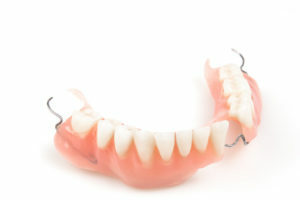 Dentures, like teeth, require care, attention and cleaning and we will assist you in the process of becoming familiar with what’s involved in looking after your dentures.